Lowes Black Friday Deals for 2018 – Artificial Christmas Trees as low as $59 & more! 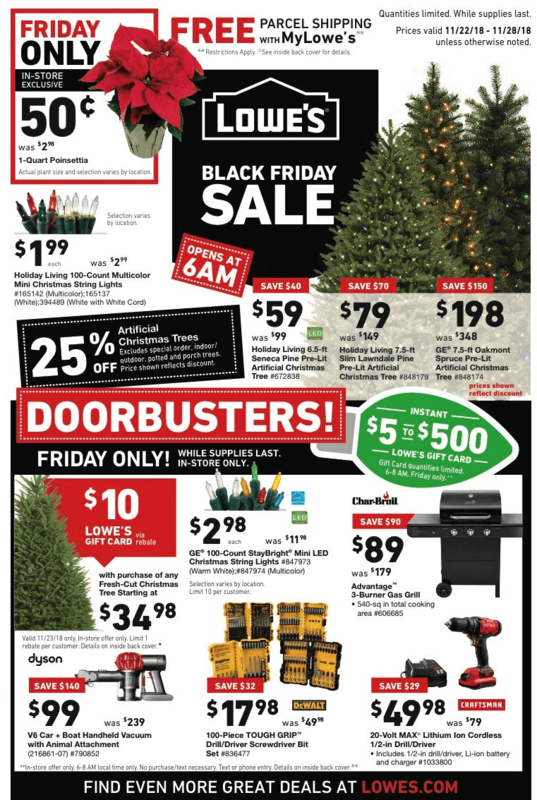 Lowe’s Black Friday deals ad it out! They will be open starting at 6am on Black Friday. However online shopping should start on Thanksgiving. Quantities are Limited. Check with your local store for store hours and details. They are offering free parcel shipping with MyLowe’s. Prices are valid from Thurs 11/22 – 11/28 unless otherwise noted. Check out the 2018 Lowe’s Black Friday Ad Preview, Deals and Store Hours! You can see the full Lowe’s Black Friday ad here. Don’t forget to check out our Black Friday deals page where we’ll keep you up to date on all the latest Black Friday deals as they become available. Make sure to shop online at Lowes.com for the Black Friday deals too, to save yourself a trip to the store! Some of the deals are live now online!